DETROIT, MI (March 29, 2012) — By popular demand, The Detroit Shoppe at Cobo Center will remain open for all meetings, conventions and trade shows following the shop’s successful debut during this year’s North American International Auto Show and Autorama. 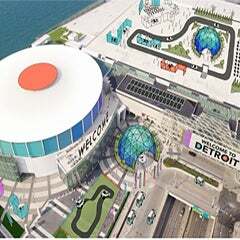 Like The Detroit Shoppe at Somerset Collection, all proceeds from the sale of merchandise at the Cobo Center store are donated to Detroit arts and cultural institutions, non-profit organizations and social service groups. Since The Detroit Shoppe opened at Somerset Collection in Troy in November 2010, more than $1 million has been raised for charity. To help support the charitable mission of the project, Quicken Loans Inc. is a sponsor of The Detroit Shoppe along with Bank of America, U.S. Trust and The Detroit Historical Society. The Cobo Center location features a hand-picked selection of the most popular items from The Detroit Shoppe including products and collectibles from Detroit’s iconic food and beverage companies, branded apparel from the city’s professional sports teams, vintage photos, home accessories, gift items from Detroit’s cultural institutions, and Detroit-themed books. The store, at times, also features entertainment such as the Motown-inspired “girl group” that danced to the record label’s most popular songs during the Auto Show. 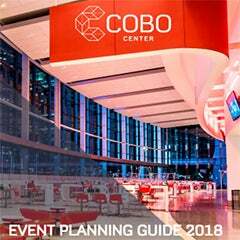 “Now everyone who visits Cobo—whether they’re from across town or around the world—can get something distinctly Detroit to take with them as a tangible symbol of a great American city,” said Dan Gilbert, Chairman of Detroit-based Rock Ventures and Quicken Loans. 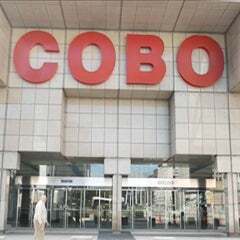 The Detroit Shoppe at Cobo Center is located on the main concourse nearest the Washington Boulevard entrance and will be open during the venue’s various events or show hours. It will also be open during Detroit Red Wings home games and other big downtown events. For additional information, please call The Detroit Shoppe at Somerset Collection at 248-816-5470. Somerset Collection is located on the corner of Big Beaver Road and Coolidge in Troy. A 700-foot long glass enclosed moving skywalk spans Big Beaver connecting Somerset North with Somerset South. Anchored by Neiman Marcus, Nordstrom, Saks Fifth Avenue, and Macy’s, Somerset Collection is home to more than 180 stores and restaurants, where many of which have their only area or statewide location, including Gucci, Louis Vuitton, Tiffany & Co., Burberry, Salvatore Ferragamo, Ralph Lauren, Michael Kors, Max Mara, Henri Bendel, St. John, as well as the casual Peacock Cafés and five sit down restaurants including Capital Grille. Information about center or store-specific events, as well as store hours can be found at www.thesomersetcollection.com. The Forbes Company (www.theforbescompany.com) is a nationally recognized owner, developer and manager of luxury, iconic shopping centers renowned throughout their respective markets for their retail innovation, fashion leadership, distinctive architecture and luxury appointments. In addition to Somerset Collection, these properties include three shopping centers in Florida: The Mall at Millenia in Orlando, The Gardens Mall in Palm Beach Gardens and Waterside Shops in Naples. Quicken Loans Inc. is the nation’s largest online home lender and a top five retail lender. The company closed a record $30 billion in retail home loan volume across all 50 states in 2011. Quicken Loans generates loan production from five web centers located in Detroit, Ohio and Arizona. The company also operates a centralized loan processing facility in Detroit, as well as its San Diego-based One Reverse Mortgage unit. Quicken Loans ranked #1 in customer satisfaction among all home mortgage lenders in the United States by J.D. Power and Associates in 2010 and 2011. “QuickenLoans.com” has been named “Best of the Web” by Forbes and Money magazines. The company ranked in the Top 10 of FORTUNE magazine’s ”100 Best Companies To Work For” in 2012 and has placed among the top-30 companies on FORTUNE’s list for the past nine years. It ranked in the Top-15 of Computerworld magazine’s “100 Best Places to Work In Technology” for seven years in a row. The company moved its headquarters and 3,700 of its more than 5,000 team members to downtown Detroit. Another 1,000 team members are expected to move to downtown Detroit in mid 2012. For more information about Quicken Loans, please visit www.quickenloans.com, on Twitter at @QLnews, and on Facebook at www.facebook.com/QuickenLoans.